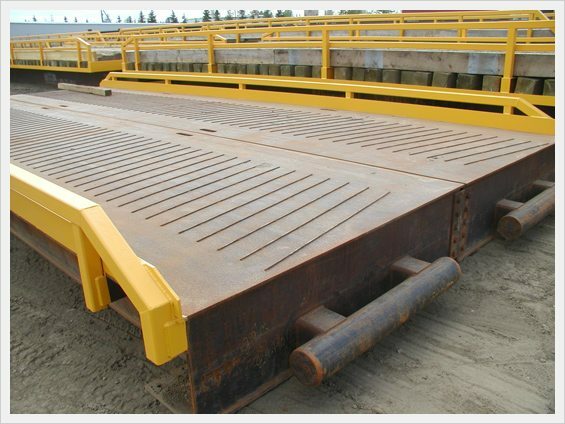 Our All Steel Portable Bridges are the ultimate in easy to transport and set up access solutions. Small enough to require no piloting vehicles on transportation (<80ft) and built to be winchable or skiddable, we can get our bridges in place fast. Temporary steel bridges are often used for detour bridges while conducting bridge repair, highway replacement projects, or while working to build permanent bridges. Prefabricated in two pieces and split down the middle, Steel Bridges are a quick and easy solution for these types of projects because they are low profile and can be placed with minimal earth works and end fill (gravel) required to tie the road grade into the bridge surface. Steel bridges can give you access to areas that have water obstacles or crevasses that are in your way. Hard to reach places are no problem for steel bridges because they are winch-able and skid-able to get through rough terrain. The easy installation allows portable bridges to be launched over most crossings. It's safe and efficient with minimal dirt work being required for end fills. Regardless of the industry, you’re in, All-Steel Portable bridges help to obtain access over creeks, rivers, and small valleys. Once the bridge installation is complete, industries such as; logging; oil and gas; mining; forestry; transmission and distribution; or emergency access, can proceed with further operations to any site. Installing a temporary steel bridge can protect the land where you’re working and lessen the impact of your activities on the environment. Environmental buffers on creek crossings such as riparian management zones need to comply with environmental regulations and have zero disturbance within that area. The use of steel bridges can allow the client to obtain the permit that is necessary for them to cross that environmentally sensitive land or body of water, without invading or disturbing anything within the zone.